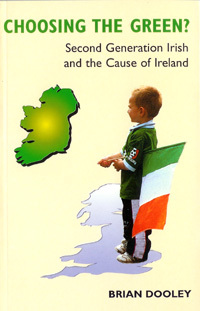 As recently as the 1970s, it was argued that the Irish in Britain were unique, because of the fact that their children assimilated totally into the British population within a generation. If nothing else this book is a spectacular refutation of that assumption. Choosing the Green looks at the second generation Irish (mainly in Britain but also elsewhere), through their relationship to the Republican tradition. Dooley also examines others for whom attitudes to the conflict were decisive. Arguably, this range of opinion is not that that different from the spectrum among the Irish-born. Nevertheless, Dooley is right to apply a political perspective. The second generation dilemma, how far to identify with Ireland, and how far with Britain, surely derives much of its urgency from the political relationship between the two countries. Dooley produces an impressive list to demonstrate that second-generation people have helped to define the course of that relationship. It’s well-known, of course that James Connolly was born in Scotland, but how many people know that Tom Clarke, first signatory of the 1916 Proclamation, was born on the Isle of Wight. They were far from the only second-generation people involved in the 1916 Rising. Dooley records the presence of Volunteer units from London, Liverpool, Glasgow, and elsewhere. Many of the men involved went on to play an important part in the War of Independence. For example Sean Nunan of Brixton accompanied Michael Collins during the famous incident when he sneaked into the Brunswick Street. Dooley also looks at later periods. Interestingly, he notes that two second-generation IRA chiefs of staff, French-born Sean McBride and English-born Seán MacStiofáin, both opposed launching major bombing offensives in England. Only when each man was ousted did the campaigns of the 1930s and 1970s begin. In MacStiofáin’s case, it is tempting to link his stance to the fact that he grew up during the Blitz. MacStiofáin, born John Stevenson to an English father in Leytonstone, is the object of a remark quoted by Dooley, which captures mach of the suspicion surrounding the Irish identity of the second generation. The irony, of course is that Myers’ remark could equally be applied to those in Ireland who see themselves as on the margins of British identity, as much to the Irish-born Duke of Wellington, who said “being born in a stable does not make one a horse,” as to Napoleon. It is perhaps inevitable that identities are defined at the margins. Dooley shows this process at work. He looks at second-generation republicans from the Fenians of the nineteenth century, down to Diarmuid O’Neill, the IRA member shot dead in controversial circumstances in 1996. He also looks at the second generation people who joined the British Army, as well as those who were victims of the conflict, such as those killed in the Birmingham pub bombings, or the children of the Maguire family, the youngest of whom was only thirteen he was arrested and wrongfully convicted. A work which covers so much ground inevitably cannot be comprehensive. There is certainly scope for more detailed material about republican activity in Britain during the War of Independence, for example. Nevertheless, for a relatively short and readable book, Choosing the Green is packed with information. This is a credit to the author given that he apparently he wrote the book during his spare time. It deserves attention from anyone interested in the history of the Irish in Britain and particularly the second generation. Their story is one which has not been told too often after all. As Dooley writes: “Irish communities in London or Glasgow did not keep the memory of local republicans alive the way they did in Tralee or Clonakilty. No one published a pamphlet on the London-Irish Fighting Story, and the contribution of British-born volunteers was very quickly consigned to obscurity.” Choosing the Green will undoubtedly help to fill that void.